My favourite Earth Swoop tour of the past week is this tour of the buildings of the Canadian-American architect Frank Gehry. The Google Earth browser is a great tool to showcase the work's of architects. 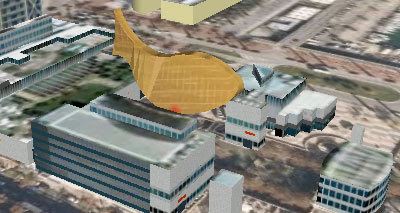 My only disappointment with this is that at the moment there are so few of Gehry's buildings available in the Google Earth browser plug-in. Berlin is truly a wonderful city. This tour of Berlin and Potsdam takes in some of Berlin's historical buildings and the remnants of Potsdam's Prussian heritage. 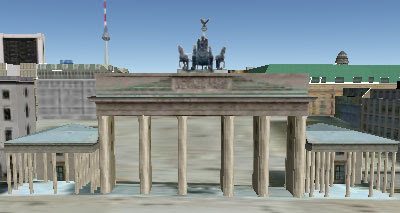 The tour takes in the Bundestag, the Brandenburg Gate, the Sanssouci and a few other delights. Both tours require the Google Earth browser plug-in and only work in Windows. "The last three years have fundamentally changed the way people understand their location and geography. Looking at interactive satellite imagery of our globe is now commonplace. The next three years will bring even more innovation, unleashing greater data and details allowing users to understand not only the greater planet around them but their own personal web of friends and locations that sit inside of it. Take the opportunity to explore these technologies, not only to learn more about planet Earth but also what your personal slice of it looks like – maybe soon in real-time."